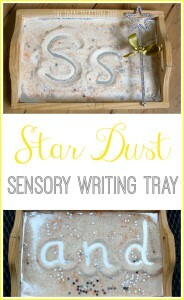 Make a magical sensory tray for mark making and early writing using homemade fairy dust and exciting added extras! 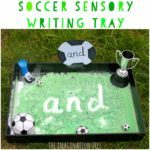 Such a fun way to ignite the imagination and enthusiasm for young children as they learn their letters and sight words in a playful, hands-on way! As an early years teacher I am always keen to place a heavy emphasis on learning through fun, creative and playful ways that don’t seem like “work”. Children are much more motivated to learn and attempt new skills if it is connected with a favourite topic and set out in a hands-on, exiting way. 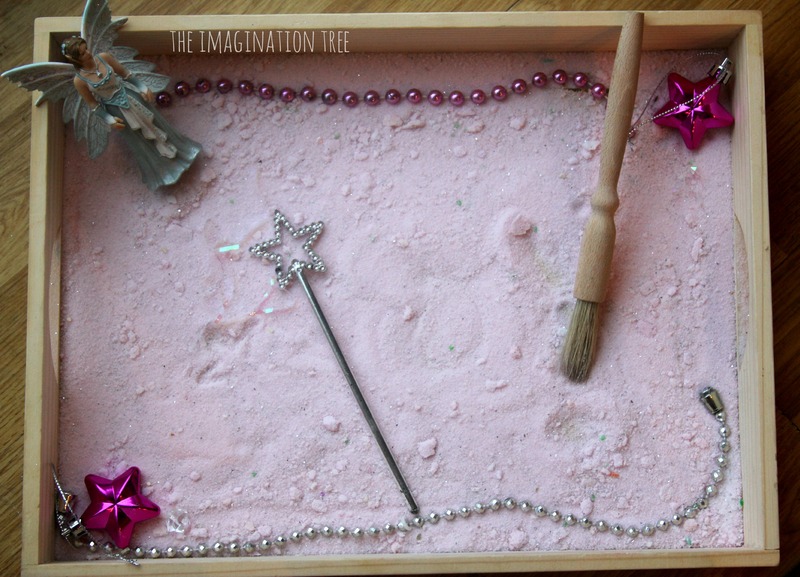 A little while ago we made a writing and mark making tray using homemade “moon dust“ and it was a huge hit with the girls! 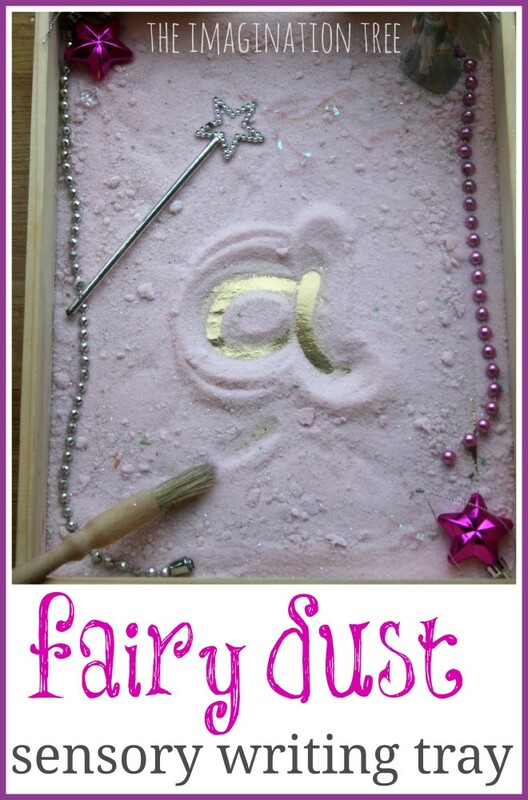 The next sensory writing tray material we just had to make was some fairy dust! 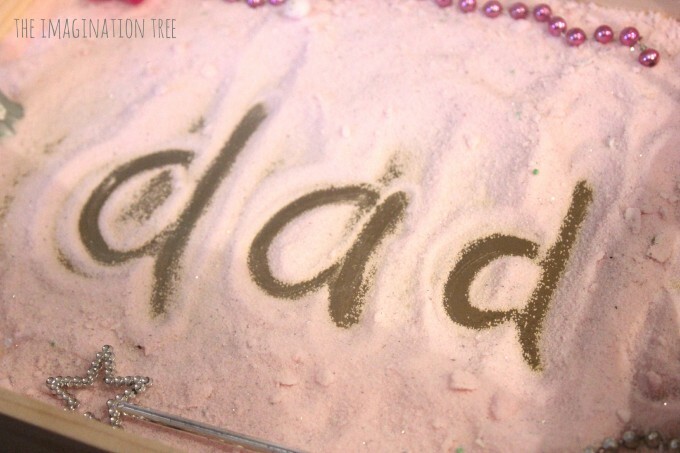 To make the fairy dust we simply added a few drops of pink liquid food colouring (add a few drops of water to it if using gel colours) to a bag of fine table salt. We shook it up and mixed the colour into the salt evenly through the bag and then tipped it out onto a baking tray to dry. 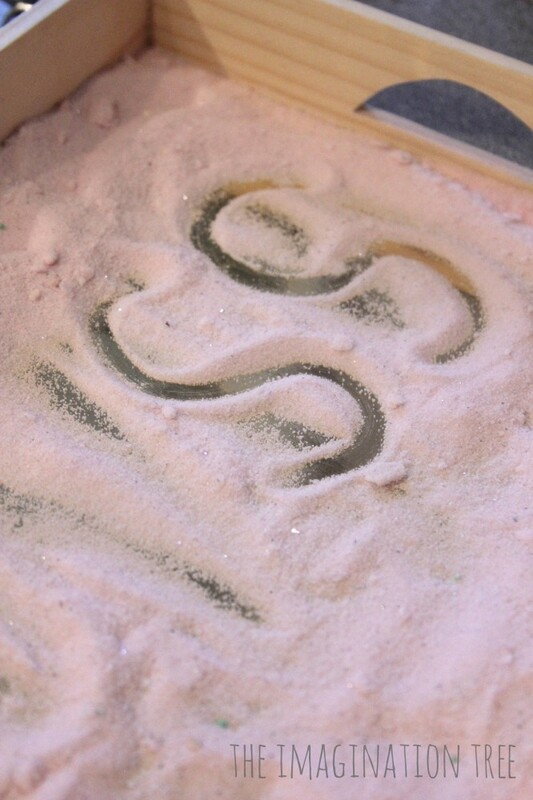 A short while later we stirred through some sparkly silver glitter to add some magic to it! I lined our wooden tray with some gold card to create a magical, contrasting colour underneath that would shine through when marks were made in the salt. 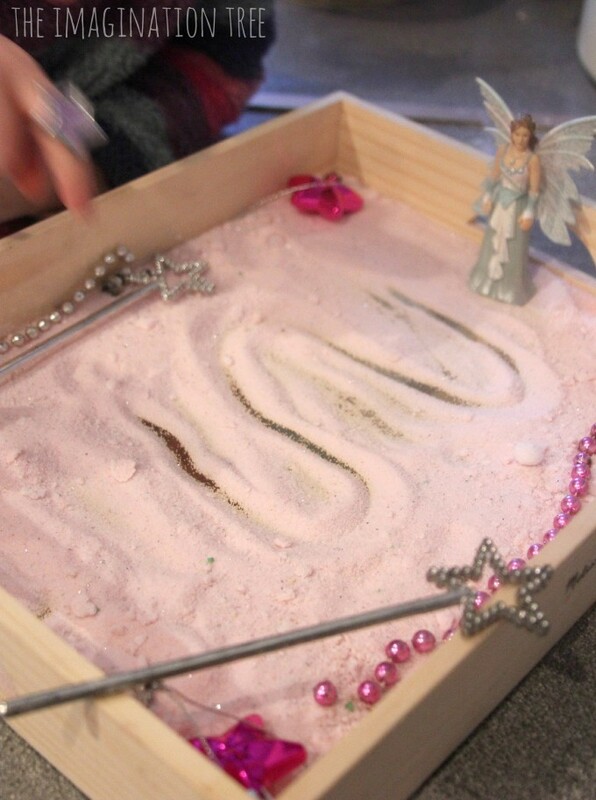 Then we tipped in just enough fairy dust to cover the bottom with a small depth. If too much is added it is difficult to see the underlaying gold colour when playing, and this is an important factor! Into the tray I also added a toy fairy figure, a small silver wand, some jewellery, plastic star decorations and a pastry brush for brushing over the salt to smooth it out after use. We used a sparkly star ring to go onto their writing fingers as a way of marking out which one they would be writing and mark making with and to make sure they kept it consistent. This was considered a lot of extra magical fun! The fairy whispered which letters, shapes, patterns or words that she wanted to see magically appear in the dust, then they did their best to write them for her! With Pop I gave her some simple, hand-drawn pattern cards to copy, following zig-zags, waves, loops and squiggles, for some simple pre-writing practise. She then worked on letters from her own name (these are always the first letters I would introduce to a child when learning to read and write) and some others that she copied form alphabet charts nearby. Cakie worked on her letters too, getting them a similar size to each other and practising those that she sometimes reverse. 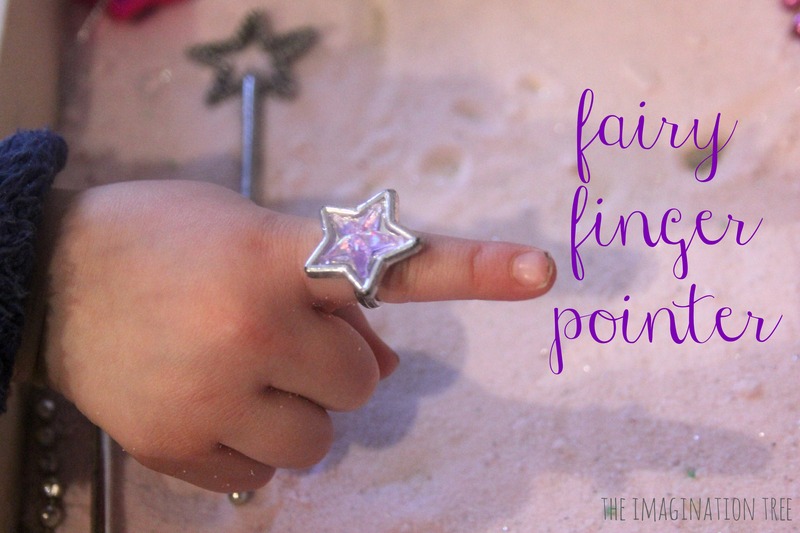 This “fairy dust” is a lovely materials for making mistakes in as it can easily be brushed over to start again and it feels low-pressure and fun. We also played a game where the fairy called out some sounds phonetically that Cakie had to write down, then read back what little CVC (consonant-vowel-consonat) word she had written. We played this in reverse too with the words being called and her sounding them out to write down herself. 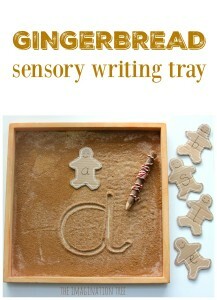 There are plenty of opportunities for all sorts of play with this diary dust sensory writing tray, from working on numbers and shapes to drawing pictures and learning words. 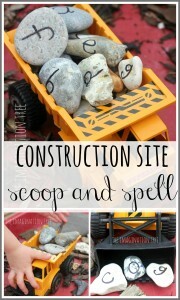 It is possible to extend or simplify it for toddlers to school age and is a lovely calming playtime in its own right! See our calming lavender version of this salt tray play too. 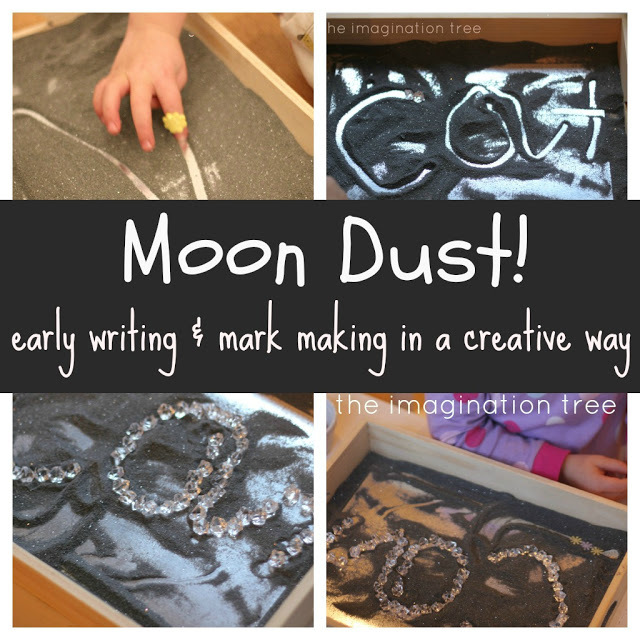 See how to make sensory moon dust here! Search our extensive Playful Literacy archives here for more fun activities! 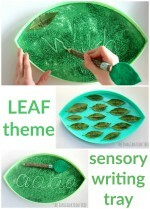 I so love all your ideas and will definitely be using this one when my new reception children start next autumn. I wanted to ask though what colourings do you use for your dust/playdough and other projects? I’ve always used whatever food colouring I get at the supermarket but they are much less vivid than they used to be (apart from red) and I end up with sludge green or sludge blue and a really insipid yellow. Works for some projects (play dough ice cream) but definitely not for others. I use Wilton gel colours (bought via Amazon) and they’re fab! We did this today!! 😀 I might have made too much as it didn’t mark make like yours. I am feeling daft this has just dawned on me as why now! I used a wee bit of poster paint instead of food colouring, I had assumed that was why! I currently use holiday cookie tins for my children. I tip the salt into the lid so the lip doesn’t get in the way of the arm. Then, when we are finished, it pours right back into the tin and the lid closes. It isn’t as pretty as yours, though…I may have to pull out the magical fairy dust! 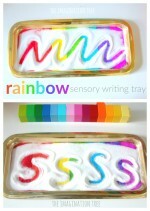 Such a sweet idea!